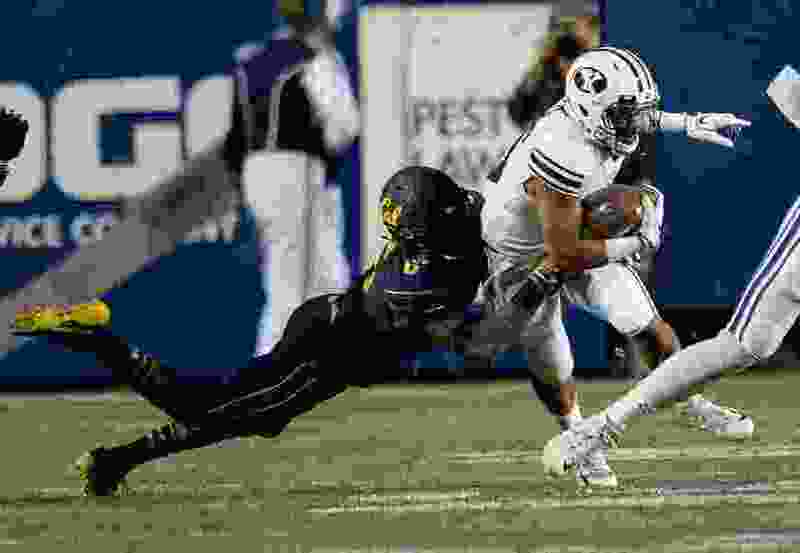 (Francisco Kjolseth | The Salt Lake Tribune) California Golden Bears safety Jaylinn Hawkins (6) takes down Brigham Young Cougars wide receiver Aleva Hifo (15) during the first half of the NCAA college football game, Saturday, Sept. 8, 2018, at LaVell Edwards stadium in Provo, Utah. Provo • If the 2017 football season taught BYU fans anything, it was that no opponent can be considered a gimme, no game a cakewalk. Losses to East Carolina and UMass and a narrow escape against Portland State are evidence of that. So as the Northern Illinois Huskies venture into LaVell Edwards Stadium Saturday for a rare afternoon kickoff (1:30 p.m.) in Provo, nobody associated with the up-and-down BYU program is expecting an easy time with the Mid-American Conference power. The Cougars (4-3) and Huskies (4-3) are both coming off bye weeks, and BYU is a touchdown favorite, perhaps only because it is playing at home. Northern Illinois is in Big Ten country, and plays like a prototypical Big Ten team: Stout defense, run-oriented offensive attack and solid special teams. And the Huskies feature arguably the nation’s best pass rusher, converted running back Sutton Smith, a redshirt junior. “There are a lot of plays that he makes on film that are really impressive,” BYU backup quarterback Tanner Mangum said of the 6-foot-1, 237-pound defensive end. Sutton has plenty of help. NIU held Utah to 10 offensive points in a 17-6 loss to the Utes on Sept. 8 and gives up just 350.7 yards per game. The Huskies’ two other losses were to Iowa and Florida State. They are 4-0 in the MAC. Northern Illinois allows just 2.72 yards per carry, sixth-lowest in the country. BYU gained 280 yards on the ground against Hawaii’s weak rush defense, but was unable to run the ball consistently in the two games prior to that outburst. BYU receiver Aleva Hifo said NIU has one of the better defenses the Cougars will face this season. “A lot of people may look down at Northern Illinois just because of whatever reason they feel, but it is a really good football team and it will be a good test for our offense and a good test for Zach [Wilson],” Hifo said. Northern Illinois’ offense has sputtered at times, just like BYU’s has, but posted more than 400 yards for the first time in a 24-21 win over Ohio last time out and seems to be hitting its stride. Marcus Childers is the kind of dual-threat quarterback that has given BYU fits in the past, and running back Tre Harbison averages 4.9 yards per carry. Wilson, a freshman, will make his second-straight start at quarterback for the Cougars, after throwing for 194 yards and three touchdowns in the 49-23 win over Hawaii two weeks ago. Senior running back Squally Canada, who averages 4.7 yards per carry, is expected to return after missing the Hawaii game due to a concussion. BYU offensive coordinator Jeff Grimes said it will take a balanced offensive effort, a good mixture of running and passing, to move the ball on the Huskies, who held Utah to 354 yards. About the Huskies • They have made it to a bowl game in 11 of the past 15 seasons and played in eight straight from 2008-15. … They are coming off a bye week after defeating Ohio 24-21 on Oct. 13 and lead the Mid-American Conference with a 4-0 league record. … Defensive end Sutton Smith led the country in sacks last season with 14 and and has seven this season. … Dual threat QB Marcus Childers has passed for more than 900 yards and rushed for nearly 300 yards in 2018. About the Cougars • They are returning to action for the first time since downing Hawaii 49-23 in Provo and will start freshman Zach Wilson at quarterback for the second-straight game. … They are 117th in the NCAA in total offense, averaging just 330 yards per game. … They are 41st in total defense, giving up just 353.7 yards per game. … They have had 10 or more players catch passes in three games this season and are led in receiving by junior Aleva Hifo, who has caught 21 passes for 225 yards.